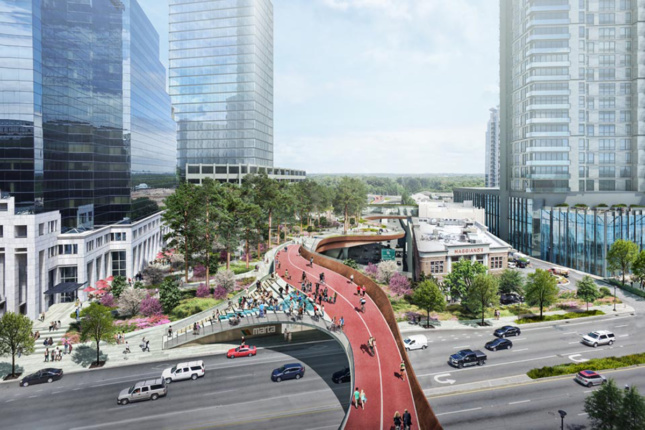 Three groups in Atlanta are proposing to cover portions of the city’s congested downtown highways with deck parks, or green spaces built over highly-trafficked roadways. Riffing off the recent rails-to-trails developments found in New York such as the High Line or Hudson Yards, these park-like platforms would attract newcomers and new development to Atlanta’s urban core while still allowing cars to continue crossing underneath. According to the Wall Street Journal, several schemes are underway to reimagine Atlanta’s notoriously crowded interstates with deck parks. One proposal, dubbed The Stitch is being touted by Central Atlanta Progress (CAP), a nonprofit community development organization that works to improve and preserve the downtown area. 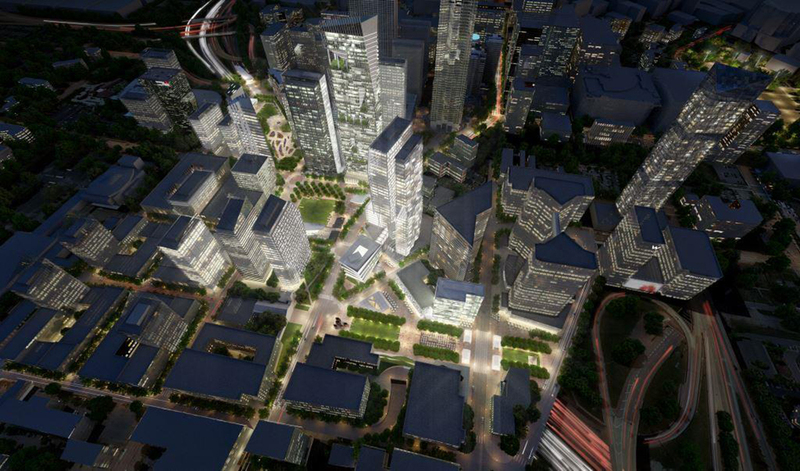 If built, the 14-acre park plan would span the I-75 and I-85 Downtown Connector from the Civic Center MARTA Station to Piedmont Avenue, creating a series of urban plazas and corridors for walkable and recreational space as well as special programming surrounding Emory University and the Georgia Power headquarters. Mixed-use residential projects, restaurants, retail, and medical buildings are also envisioned for The Stitch. Though it seems like an ambitious undertaking—creating a new elevated public space with room for future tall construction—projects like this have been done before. In 2012, the 5.2-acre Klyde Warren Park was completed over the Woodall Rogers Freeway in Dallas, Texas. The city is currently constructing another one near the Dallas Zoo designed in collaboration with OJB Landscape Architecture. Similar initiatives set over abandoned infrastructure have also been erected over the last decade like Atlanta’s own Belt Line, boosting real estate values and enhancing green spaces in underutilized areas. The WSJ notes this is a growing trend. Nearly 30 cities around the U.S. have suggested deck park developments in recent years. 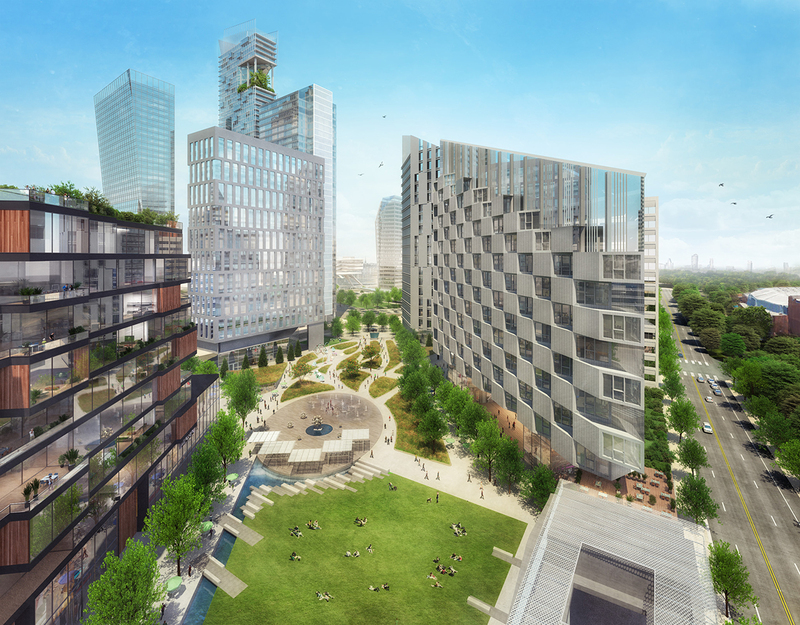 Given Atlanta’s rising population and booming downtown development, it looks like the leading Southern city is on track to level up as an urban hub. Georgia already boasts the nation’s largest tree canopy in a major metropolitan area, so adding serious acreage to downtown seems like a logical next step. And because Atlanta didn’t secure Amazon’s HQ2 bid, creating one or multiple deck parks in the city center could actually be a viable way to charm tech companies that want dynamic urban environments for their young employees. Besides The Stitch, another plan under consideration in Atlanta is a $250 million proposal for a 9-acre deck park covering Georgia State Route 400. 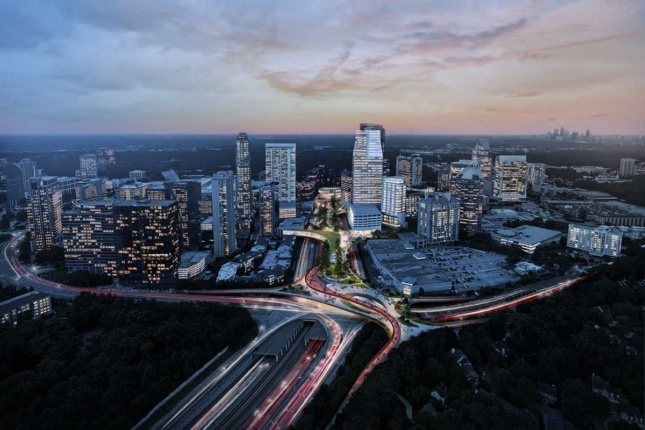 Buckhead Community Improvement District (BCID) and Rogers Partners Architects + Urban Designers released renderings of the project in 2017 and announced a planned groundbreaking for 2020. Over the last year, the BCID has been busy raising money for the project. In another section of the city, it’s rumored that Chick-fil-A CEO Dan Cathy is looking to build a deck park along North Avenue at the I-85 and I-75 interchange in order to better connect Midtown Atlanta with Georgia Tech. Further details on the idea have not yet been released.